"Human beings created racism...God created one race, the human race..."
Earlier today as I was having dinner with my sister, we were discussing what her English class was about today. She was telling me that in honor or Martin Luther King Jr. her teacher had played clips from an Oprah show titled: Race In America: A 25 -Year Look Back. My sister started telling me how Oprah had reflected on past shows that she had done about race and all of the changes that have happened since those shows aired. As my sister was explaining the show it sparked my curiosity to go and find the clips on youtube or on Oprah’s website and see what those shows were all about. I was quite young when her show started so there are many of her past shows that I’ve only seen few clips of. Oprah is known for the variety of topics discussed in her shows and she has previously said that “……thanks to him (Martin Luther King Jr.) and the civil rights movement that she has become the woman she is today….” It is not surprising that during the past twenty-plus years that her show has been on the air, she has featured multiple shows about racism, discrimination and many other sensitive topics. The show that aired on Monday was such an eye-opener, many of us were little when one of her first “race” shows aired and to be able to take a look at those clips today and unfortunately hear and see the ignorance that surrounded our country then and still prevails today it is quite shocking. During one of the clips, Oprah recalls visiting Forsyth County, Georgia, some miles from Atlanta where back in the 80s it was a predominantly white community known for the prejudice against other races, especially African-Americans. 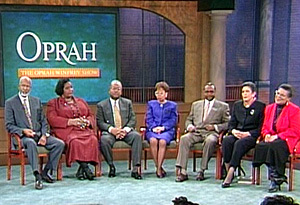 During the taping of the show, Oprah talked to several residents who insisted on having the right to live in an “all-white” community. While watching the clip I couldn’t help but wonder how Oprah must have felt. Here she was a still unknown talk show host who had to remain neutral and not show how disgusted she probably was to hear all the non-sense those people were talking, the pain she must have felt to hear them look down on other people and the pain in her heart and what she probably endured once she was “off the air.” Today, that same county is one of the richest in the country and about 7,000 African American currently reside there. There was another part of the show which featured the “Little Rock Nine.” The students from Arkansas who were integrated into high school and whose first day in school caused an up-roar back in 1957. In 1996, Oprah interviewed those same students now in their 50s along with some of those “white” students who chanted for the black students to leave the school and were against the integration. One of those students showed her remorse for what she had done and explained that she had been raised in a racist household but that she had changed her ways and was teaching her kids the opposite. As I heard her talk I couldn’t help but wonder, what moral character does she have to try to teach her kids not to be racist when her picture is featured on history books as the face of racism itself? There were so many more clips that I could never finish talking about all of them with this blog; I was so moved by the entire show. Although it is true that a lot of the people featured on these shows changed their ways and realized their ignorance, it is unfortunate to know that there are millions of people out there who still discriminate against others. It poses the question, how will our country and the rest of the world be like in another 25 years? There’s been a lot of progress towards equality and Martin Luther king Jr. certainly paved the way but I wonder, will we ever reach a point where we can be understanding of one another, embrace our differences and live in peace?